Bold. Daring. Smart. Fun-loving. Flappers are still cultural icons today, representing not only a generation of fearless women, but also their iconic style choices. While the period leading up to the Roaring 20s kept women covered and restricted in corsets and long skirts, Flappers defied these societal norms, daring to shorten hems and change silhouettes. In doing so, they started a movement that still holds power today. 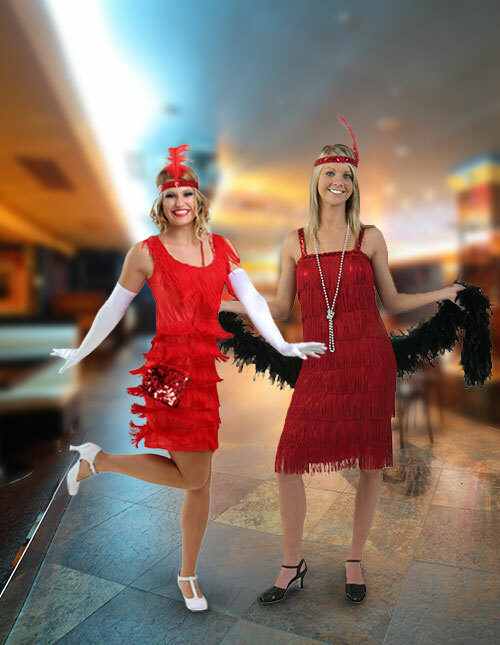 Choosing a 1920s Flapper costume is a bit of a rite of passage for any bold lady, because this era called for opulence, confidence, defiance, and a hefty dose of style that’s worthy of the women who started it all! But, first things first, you’re going to have to get the costume. 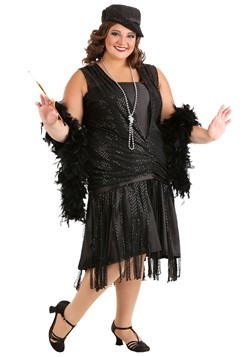 And, naturally, we’ve got Flapper Halloween costumes in a variety of styles, sizes, cuts, and colors. With our selection, we’re sure you’ll be able to find a style that suits you perfectly. So, grab a drop-waist dress, throw on a pair of kitten heels, reach for the rouge, rock a soft headband, learn the lingo, adorn yourself in pearls, sidle up to the speakeasy with a notorious gangster, brush up on your Charleston, bob your hair (or pick out a wig!) and prepare to get glitzy. 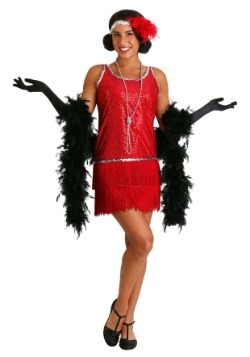 Our 1920s Flapper dresses are going to have you ready for a fantastic Halloween! The dress is the cornerstone of any Flapper’s look. A drastic change from the full-length cinched gowns of the previous era, Flappers opted for shapeless shift dresses that minimized curves, hit just below the knee (scandalous! ), and featured fringe or other embellishment. A flapper dress can’t make you a flapper alone (you’ll need the right attitude and accessories for that), but you certainly can’t become a true flapper without it. So, get dolled-up in one of these urban sets and prepare for your costume transformation! Black is the timeless marker of elegance and style. Black Flapper dresses are powerful, proud, and just a bit mysterious. You can’t go wrong with a black base for your look—trust us, a perfectly executed noir number will certainly turn you into a choice bit of calico! If you haven’t heard, rouge is IN for Flappers! Breakthroughs in makeup technology helped girls of this era add bright reds to their cheeks and lips for the first time. But, why stop there? Rouge up your look with a charming cherry-hued dress! 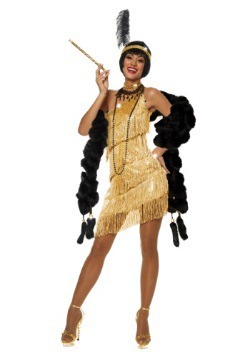 Usher in the Golden Age of Jazz with this Women’s Dazzling Gold Flapper Costume. You’ll be the cat’s pajamas and the life of the party as soon as you set foot on the scene in a posh gilded garment! What are you waiting for? Hop to it! The truly unexpected nature of a pop of purple is just why a Flapper would love it! The color of royalty, this Purple Flapper Dress will turn the stuffy hierarchy on its head and have everyone hailing you as queen—of the dancefloor, that is! 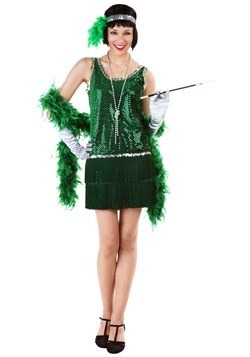 Are all Flapper costumes created equal? Not according to us! These unique and special pieces have been hand-picked by our discerning staff to tickle your fancy and put a pep in your step. They’re top sellers and perennial favorites for Halloween parties all around the world! 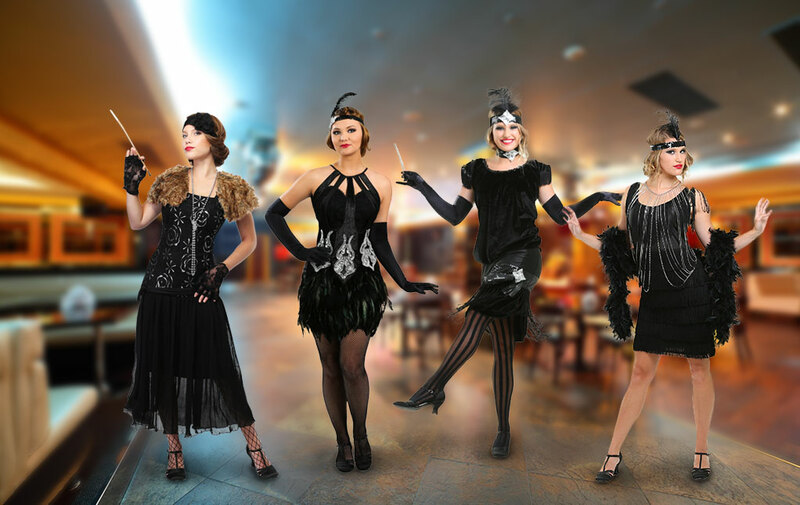 You might have a costume party or even a Roaring 20s party to attend, but either way, we’re sure you’ll be the bee’s knees in one of these gorgeous getups! 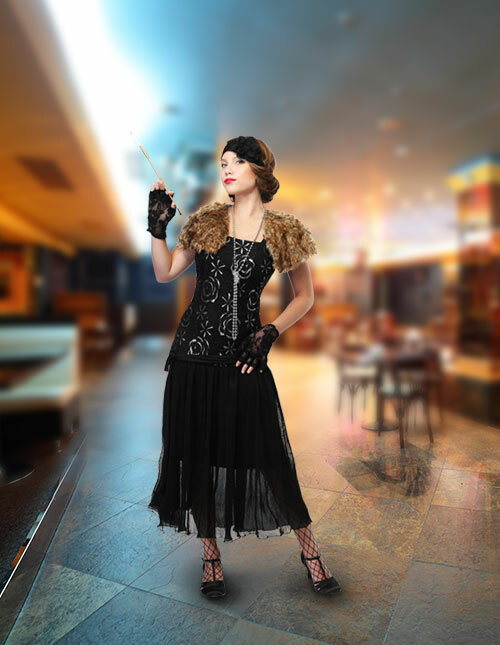 You cannot truly be a Flapper until you’ve discovered and frequented a speakeasy. 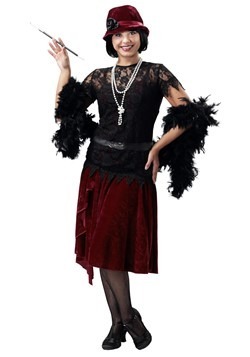 The thrill of prohibition-breaking behavior only lends more excitement to this Speakeasy Flapper Costume! Slowly sip on a Sidecar or try an Old Fashioned while the band plays the night away at the juice joint! Zelda herself couldn’t have designed a more perfect Roaring 20s Flapper Dress! In fact, we have it on good authority that Fitzgerald had an outfit just like this one. The art deco detailing and gold and black elegance make this hot little number roar whenever you wear it. 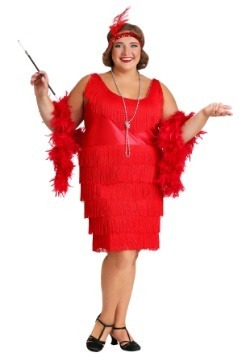 When you wear this Ladies Charleston Flapper Dress, you better be ready to…Charleston! Performing the iconic dance of the 20s is basically a requirement of any Flapper getup. So why not host a dance at your charming estate while wearing this opulent costume? You can help usher in the dance craze that took America by storm (and look great while doing so)! If you like to push the rules even more than an average Flapper, you can get super-flapper fabulous in this Women’s Downtown Doll Costume. The hemline pushes boundaries even further and the silhouette takes on a more modern, form-fitting shape, but the fringe, detailing, and attitude is 100% Flapper fierce! Kids know how to have fun, and fun is central to the Flapper lifestyle! You don’t have to remind a child to “dance like no one is watching”, they do it naturally! Kids will stay up all night, if you let them, and they are all about defying the rules. Basically, what we’re saying is that kids and Flappers go together like sequins and fringe. Also, Flapper culture isn’t all giggle water and speakeasies—encourage your kiddo to discover all the aspects of this historic era and to read up on the passionate, progressive ladies who made it unforgettable. It’s never too early to teach your child to think for themselves! 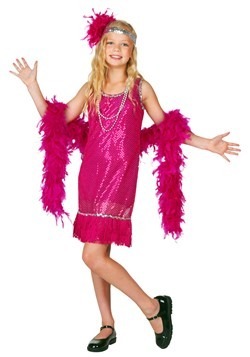 Take playing dress-up to a whole new level and let your girl go all-out in this Fuschia Sequin and Fringe Flapper Costume. It glimmers and gleams in her favorite hue—bright pink! 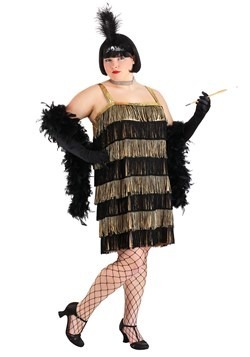 Or perhaps she’s feeling more like a “starlet” tonight—this Gold and Black Fringe Flapper Costume ought to make her feel like a 20s movie star the moment she slips on this flapper girl dress. Maybe she imagines herself at a salon of artists and writers, instead of out on the town. 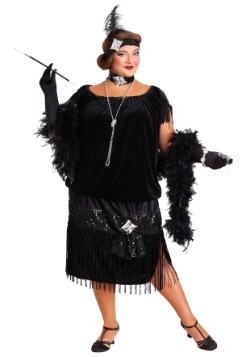 If so, this Toe Tappin’ Flapper Girl Costume will fit the bill. 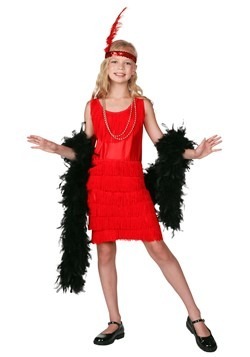 Not all Flappers dressed or thought alike, so make sure your little Jane finds the frock that fits her personality! Sure, just about any costume you put on a toddler is cute, but how many embolden them to be an individual (not to mention encourage dancing)? 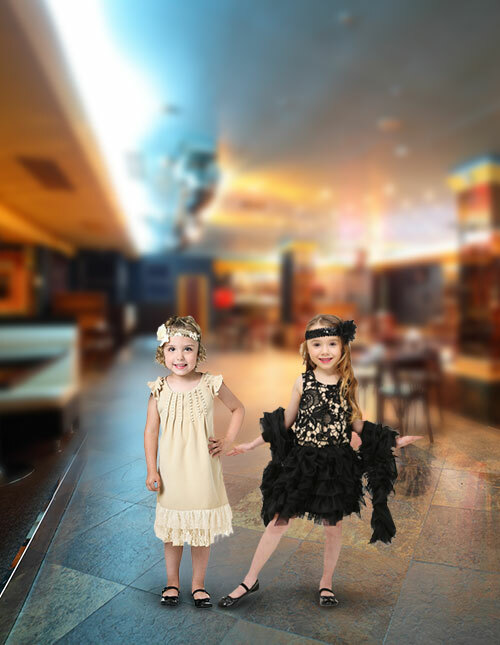 These pint-sized Flapper looks pack a big punch—plus, we have a feeling your kiddo will LOVE the fun embellishments. 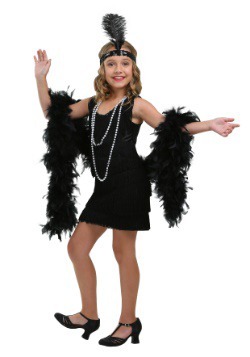 Look at this Toddler Pearl and Lace Flapper Costume! It’s a delicate and dainty daytime look; your gal will love the floral headband and lace trim. So pretty! 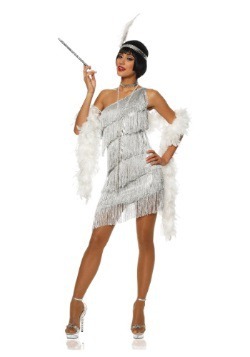 Or, this Toddler Dazzling Flapper Costume has added “fancy” appeal with its tutu-esque skirt and sequined headband! Teach your tiny one the Charleston and prepare to be blown away by cuteness—not to mention, to tire them out before bedtime! If you know a little bearcat in training who’s growing up to be a real powerhouse, offer her a finished look that’s nothing short of spiffy! These costumes embody the best of this defiant era. 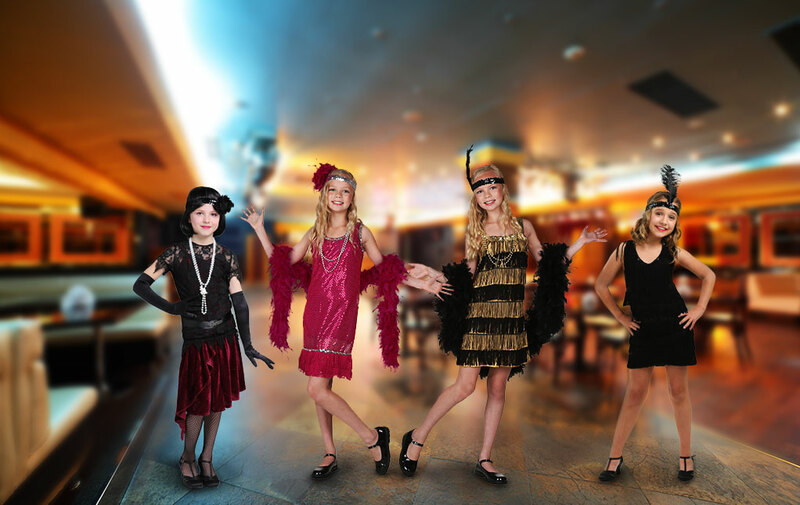 Just like Flappers, tweens know a thing or two about living between the lines—neither child nor teenager, these great kids need opportunities to develop a sense of who they are. 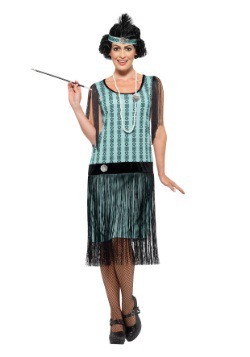 Our Flapper costumes for girls are available in sizes up to tween and teen, so, let your girl try on this Turquoise Sequin Fringe Flapper Costume and see if she lights up. 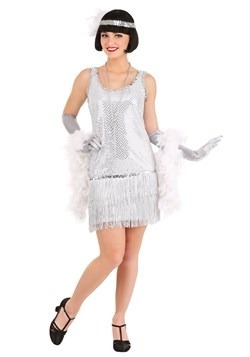 You could also take home this Dazzling Flapper Costume for her and coordinate a whole family look from the era! One of the most fun aspects of Flapperdom is the lingo! The Roaring 20s was a very unique era of American history, and the folks who lived through it had plenty of colorful language to describe the times. So, we’d highly advise learning all the buzz words, smooth talk, and funny phrases to take your look from just a costume to making it authentic performance art! We know it seems like a lot to learn, but don’t get balled up—just take it one phrase at a time. Here’s just a few, to get you started: Big cheese = important person. Dud up = dress up. Hotsy-Totsy = pleasing. Glad Rags = clothes for going out on the town. So, feel like learning some more? Attagirl, you’re the cat’s meow and then some! 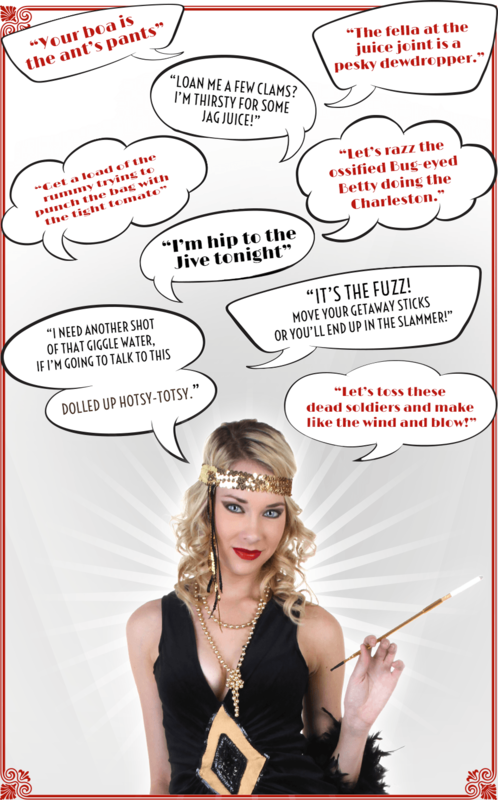 Check out this Flapper Quotes Infographic for even more popular phrases from the era. For many, the Roaring 20s were essentially a decade-long soiree. Fun! But there was actually a lot going on aside from glitz and glamour—gangsters started to control cities and organized crime rose. In turn, corruption invaded politics and the police, prohibition gave rise to the infamous speakeasy culture, talking pictures became the norm, women won the vote, the Charleston swept the world, the Jazz Age scatted in and literati such as Hemingway, Fitzgerald, and Stein became household names. Phew! So, what does this mean for your Halloween look? Everything! You see, being a Flapper wasn’t only about the fashions. The look just tipped others off to the interesting and new thoughts churning on the inside. To really nail your 1920s Flapper Costume look, you must embody the attitude. So, get ready to roll tonight and repeat after us: The world is my oyster! (Good, a little louder!). The world is my oyster! No one tells me what to do or how to live. I’m gonna paint the town tonight, because I’ve earned it! Nicely done. Now, you might be thinking about how to pair up your costume with a partner, or about how to get the whole family involved in the fun! Well, we’ve got you covered. 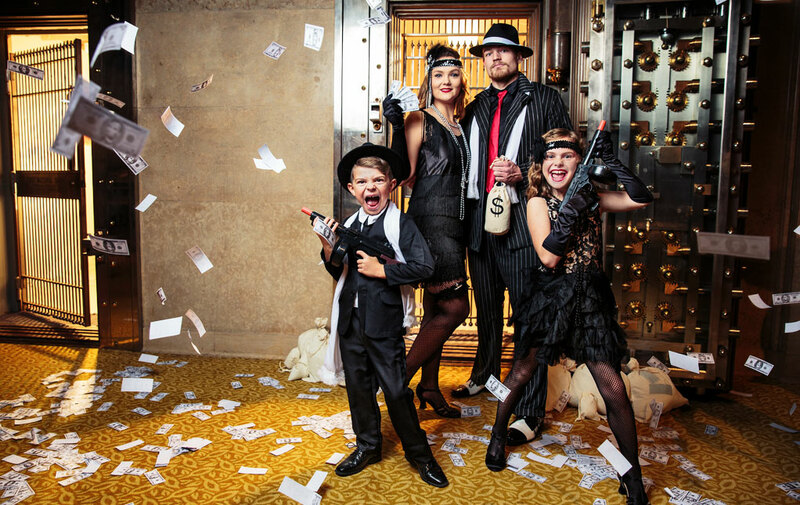 We rounded up our favorite family from the Roaring 20s, and we managed to get some couture shots of them in action. Check out these images from their costume romp, and keep reading for a few more tips and tricks on how to get the most out of your costume experience! 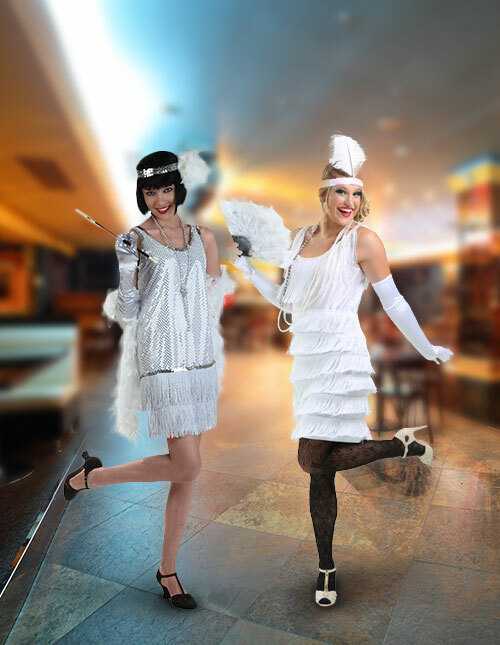 A mobster and a Flapper- is there any costume combo more thrilling, scintillating, or classic? Seeing these two iconic styles side by side instantly transports us to a classic juice joint with big band jazz blaring all around us. Prohibition led to a whole bunch of unsavory characters attempting to wet America’s whistle, so to speak. Capone ruled Chicago. Police were corrupt, and you couldn’t tell who to trust. So, if you’re ready to rule the costume party, team up with a mob boss and coordinate your looks. 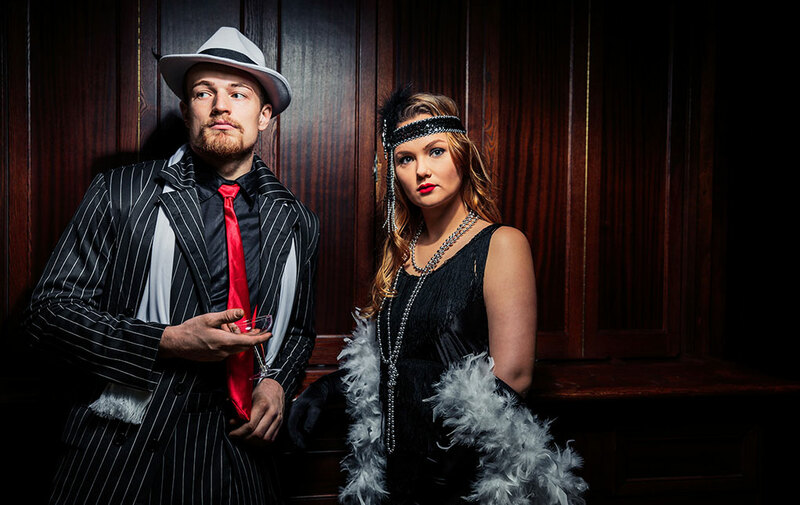 Flapper and Gangster Halloween costumes are sure to be a ton of fun, so maybe match your man’s tie to your newfangled lipstick or coordinate your boa and his hat. Talk about a power couple! Make sure he brings a toy tommy gun in case there are any rival gangs afoot or snitches hiding out at the shindig. And be sure that he’s wearing his best dancing shoes! Mob bosses must decompress too, from time to time. Step aside, boys, and let a lady show you how it’s really done! Though gang crime in the era was dominated by men, a few bold women made highly-feared names for themselves on the streets. The likes of Bonnie (of Bonnie and Clyde) Parker and “The Pretty Pants Bandit” (Marie Baker) need some new company to round out their crew. 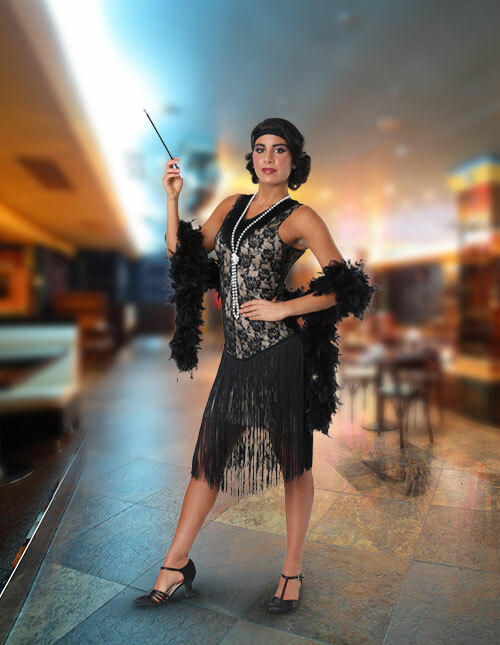 Mix and match femme Flapper embellishments and mob boss appeal to create an evening ensemble that’ll have folks shaking in their boots when they meet you. This look is so fierce, it could scare even the sun into hiding, leaving you under the perpetual cover of darkness in which to commit your crimes. Fun runs in your blood! Create the perfect trick-or-treating experience by gathering your own little gang of misfits in assorted 20s costumes! 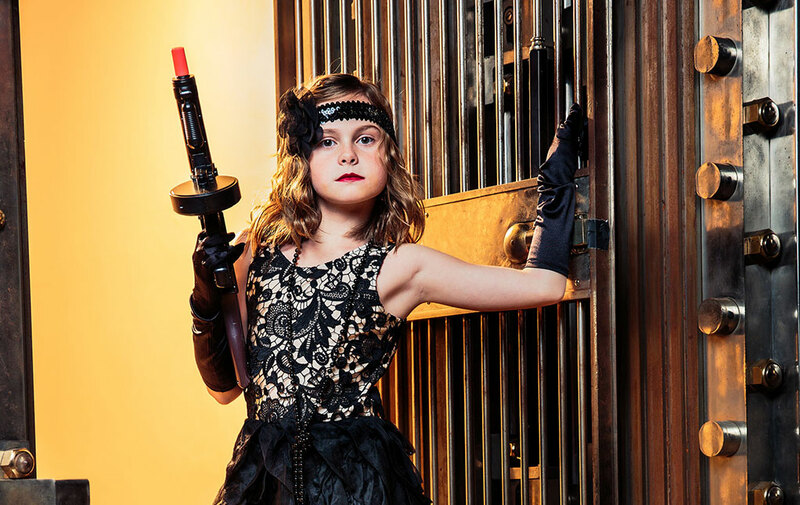 No longer will your kids have to beg you to get dressed up alongside them to go out on Halloween night—you’ll be just as eager to jump into your Flapper dress or to don your gangster fedora as they are to wear theirs! There’s no telling what the night will hold for your bold posse—maybe you’ll knock over a Jack-o-lantern full of peanut butter cups. Maybe you’ll hold up Ole’ Miss Killjoy down the street for all the licorice she’s got! Better yet, enjoy supper together, get dolled up, hit the town trick-or-treating, and show your neighbors know who’s really in charge of your streets. Then, come home and screen a classic film from the era while digging into your loot! It’s a tough world out there—with danger and intrigue on the rise and parties and payouts happening at every turn—you and yours have to stick together for a night you’ll never forget!